BREVARD COUNTY, Florida - After three years and tens of thousands of taxpayer dollars spent in legal fees, the Economic Development Commission of Florida's Space Coast (EDC) produced documents to Brevard County Clerk of Court, Scott Ellis. 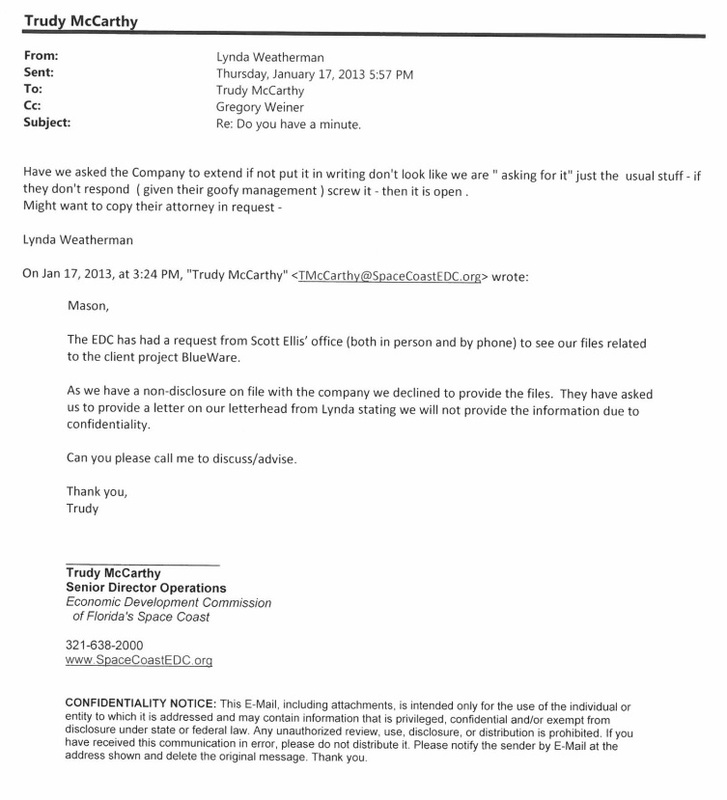 A cursory review of the documents show that EDC President, Lynda Weatherman, referred to BlueWare's management as "goofy" and instructed staff to obtain a confidentiality extension from BlueWare days after Ellis had already made a public records request. Weatherman specifically instructed staff to make the request to BlueWare without " ... looking like we are "asking for it" just the usual stuff... "
Since 2013, Ellis has maintained that the EDC and BlueWare back-dated the confidentiality extension after confidentiality had lapsed. 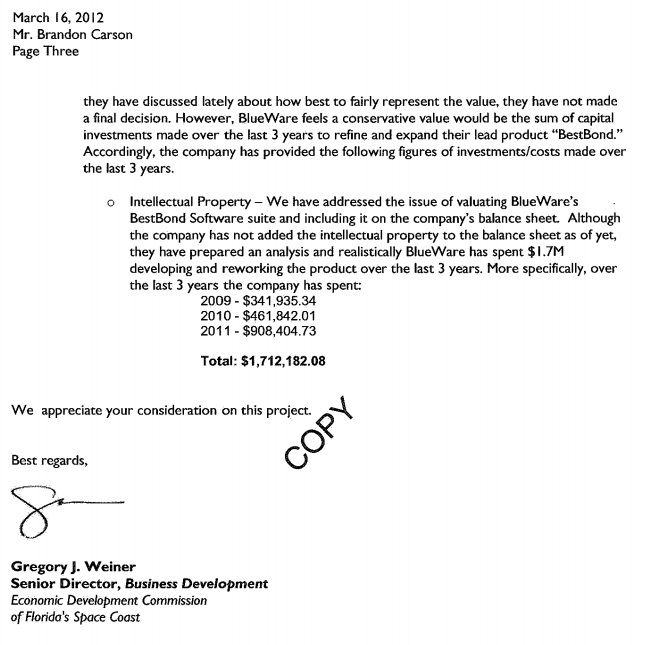 The documents also show that the EDC pushed the BlueWare project through for economic development incentive money despite red flags raised by Enterprise Florida. Specifically, that there was no valuation assigned for BlueWare's software on its balance sheets. 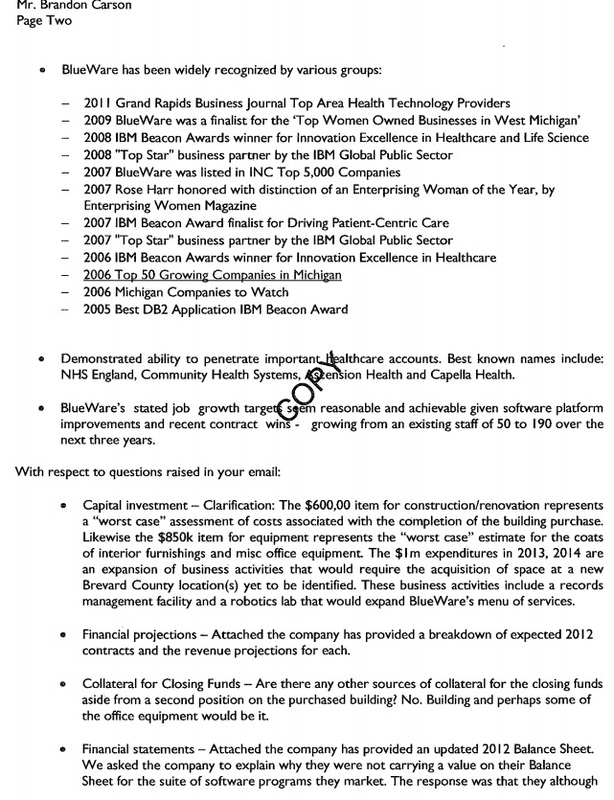 "... One of BlueWare's most important clients is Community Health Systems (CHS). 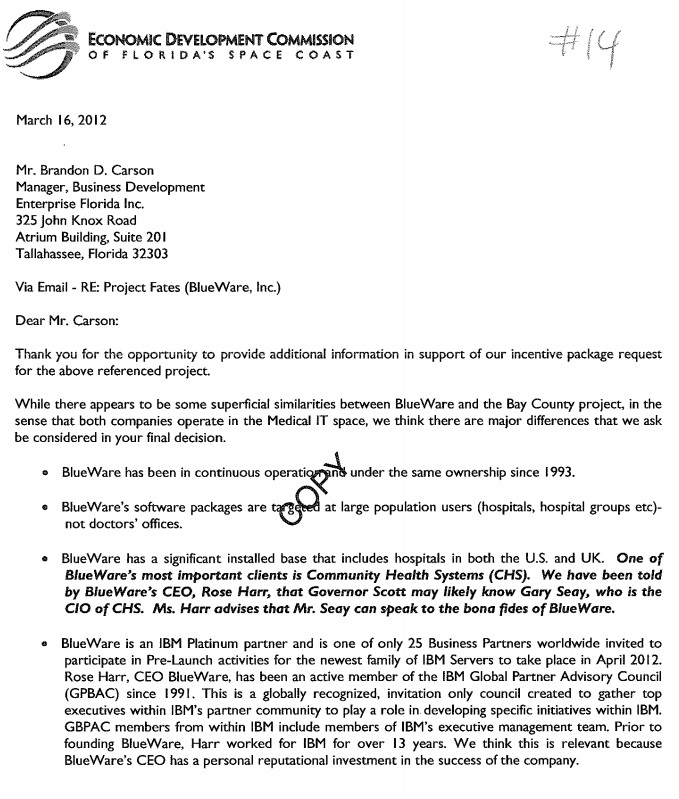 We have been told by BlueWare's CEO, Rose Harr, that Governor Scott may likely know Gary Seay, who is the CIO of CHG. Ms. Harr advises that Mr. Seay can speak to the bona fides of BlueWare." This story is breaking. Brevard Times is reviewing years of documents, timelines, court testimony and filings, along with statements made by EDC personnel to the Brevard County Commission, the public, Ellis, and the media. A more in-depth article will be forthcoming in the days ahead. BlueWare is the company caught up in a public corruption criminal case brought by the Florida Department of Law Enforcement and State Attorney Phil Archer against former Clerk of Court, Mitch Needelman, his former business partner Matt Dupree, and BlueWare CEO Rose Harr. Their criminal trial is scheduled to begin in September. The EDC helped BlueWare and some of its affiliated companies to qualify for various government programs and other "workforce incentives" that could have totaled nearly $2 million in taxpayer money. None of those incentives were ultimately awarded to BlueWare because it did not meet its performance benchmarks. After the Clerk's office learned from a Brevard Times investigative article published on August 26, 2013 that State of Florida Department of Economic Opportunity officials said the BlueWare's confidentiality had lapsed and Governor Rick Scott's Office stated to Brevard Times that the BlueWare incentive contract was canceled on April 5, 2013, the Clerk sent his auditors to the EDC in Rockledge the next day to request a copy of the EDC file on BlueWare. When the EDC refused to comply with the public records request, Ellis then filed this lawsuit. In March 2014, the trial court ruled in favor of Ellis. The EDC then appealed that decision to the 5th District Court of Appeals. In October 2015, the appellate court then sent the case back to the trial court for a second trial. The EDC and Ellis later settled the case in March 2016, with the EDC agreeing to produce all documents not exempt under Florida Statute Chapter 119 and section 288.075. The trial court later ordered the EDC to produce the documents by August 16, 2016. Brevard Times was the only news source to publish a series of in-depth investigative articles about the BlueWare scandal led by former reporter, Charles Parker.